How to have fun this summer in easy steps. We are super excited to be partnering up with LiveMom.com as part of the Austin Summer Fun Checklist. Here’s how to have fun this summer — most importantly, come dance with Koo Koo Kanga Roo this saturday! 1. 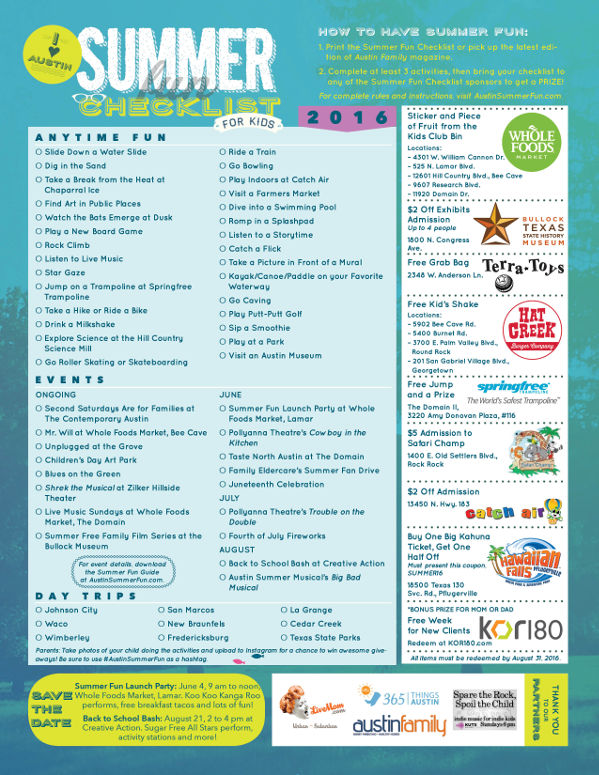 Print the 2016 Austin Summer Fun Checklist for Kids or pick up a copy of Austin Family Magazine and tear out the Checklist. Come to the Summer Fun Launch Party on June 4th, from 9 am to noon, at Whole Foods Market Lamar to pick up a copy of the checklist. Koo Koo Kanga Roo will perform at 10am and there will be free breakfast tacos from Hat Creek Burger Co., free KIND Bars and Chameleon Cold Brew Coffee, activities and prizes! Tickets are just $5 for adults, free for kids with all proceeds benefiting Whole Kids Foundation. 2. Pick an activity or two or three to do. 6. Upload photos of you and your kids doing activities on the Summer Fun Checklist for a chance to win prizes including a two-night stay at Omni Barton Creek, Chaparral Ice Skating Passes, free museum admission to the Bullock Museum, season passes to Hawaiian Falls, Terra Toys gift certificates, and free admission to the Hill Country Science Mill. Use #AustinSummerFun as the hashtag. Read more details about the weekly prize giveaways here. We’ve mapped out all of the details for the activities on the 2016 Summer Fun Checklist for Kids in the 2016 Summer Fun Guide. Read about the different activities and events, including details on places to visit on your day trips, event dates to save on your calendar. Check back here all summer long for more in-depth articles about our 2016 sponsors and activities.